Patience is a virtue. And it definitely worked for us! For rock climbers, a duffel bag is a boon. Like a gym bag on steroids, it allows a climber to conveniently and quickly pack and carry bulky rock climbing equipment. Nothing beats the ease of stuffing and hauling that a good duffel bag offers. Sweetie and I had used my trusty Deuter Futura Pro 42 to haul my rock climbing equipment during our rock climbing trips. 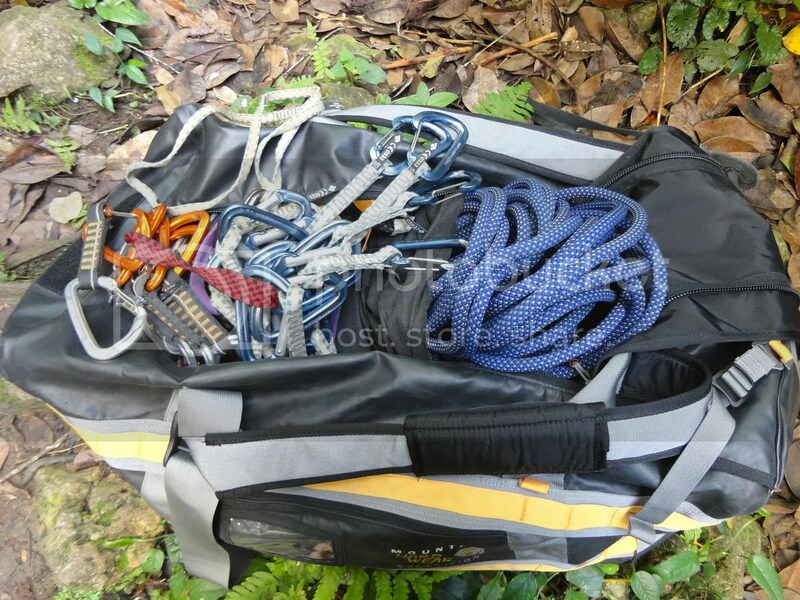 Stuffing my climbing rope, draws, harnesses, rock shoes, and other gear into the pack was a nightmare! We had to forcefully shove the items inside the pack and arrange them in a specific way so they would fit. Yes, it took an awful lot of time to pack and arrange the equipment inside. Furthermore, even if we only need to take one item, the design of a top-loading rucksack makes it necessary to unpack everything. Carrying it is also quite uncomfortable. Even when the rucksack is filled to the brim, the pack is often unbalanced. I had to constantly shift my weight slightly to the right to counteract the pull. Check out the photo below; see how misshapen my rucksack is? I’m the one carrying the blue pack. Sweetie and I decided on another approach, that is, to use a regular gym bag to haul the climbing gear. True, it alleviated some of the problems but presented new ones. For one thing, gym bags are not really designed for the rugged outdoor. The gym bag we used disintegrated in just a few uses. And even if it was the toughest gym bag, it would be a horrendous thing to carry. Consisting of only a single strap, only one shoulder carries the entire weight of the equipment. You cannot imagine the shoulder pains, headaches, and sore muscles I had to suffer carrying that pack. Sweetie and I are always on the lookout for cheaper alternatives and/or bargains. 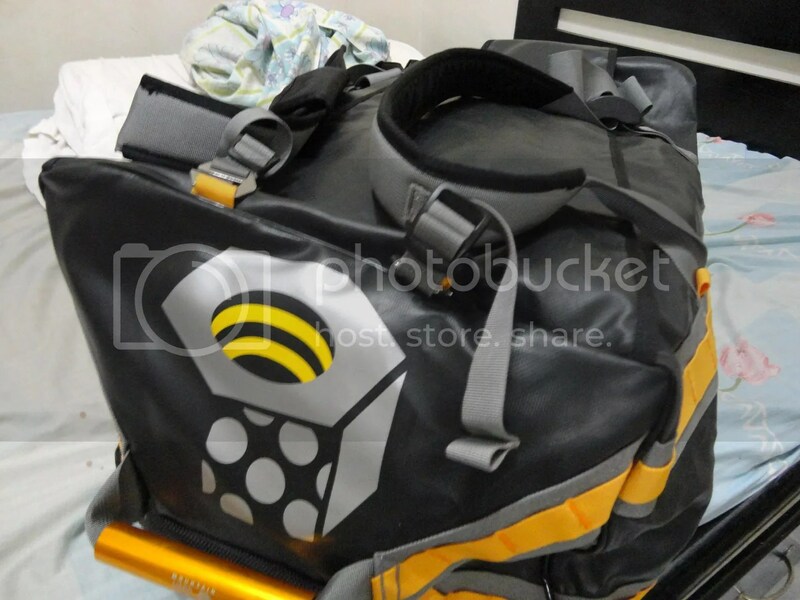 But in this case, we decided that a good quality duffel bag, even one with a high price, would be the best for us. After a long wait, we finally found the perfect one. 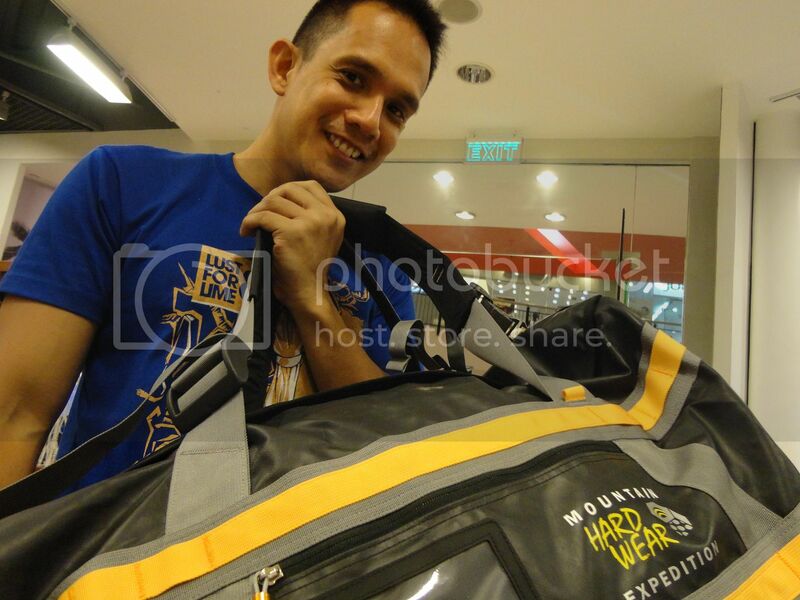 We got a really good, very tough Mountain HardWear Expedition Duffel Bag to carry our rock climbing gear. And the best thing of all? We purchased it at half its original price! In just a single glance, you can see that the Mountain HardWear Expedition duffel bag really means extreme hauling business. The material consists of a strong, PVC-free tarp that resists abrasion, moisture, and punctures. 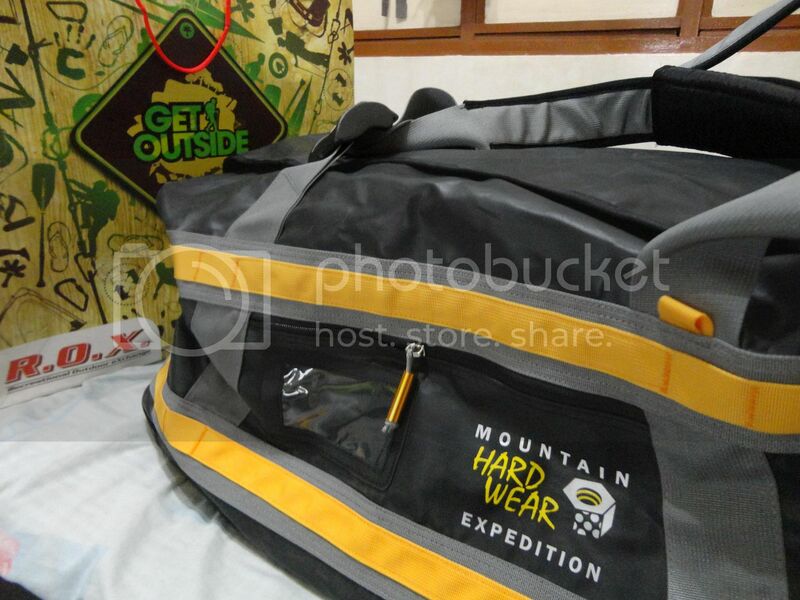 The bottom boasts of extra tough HardWear XT, which can easily eat up any rough surface that the bag is placed on. 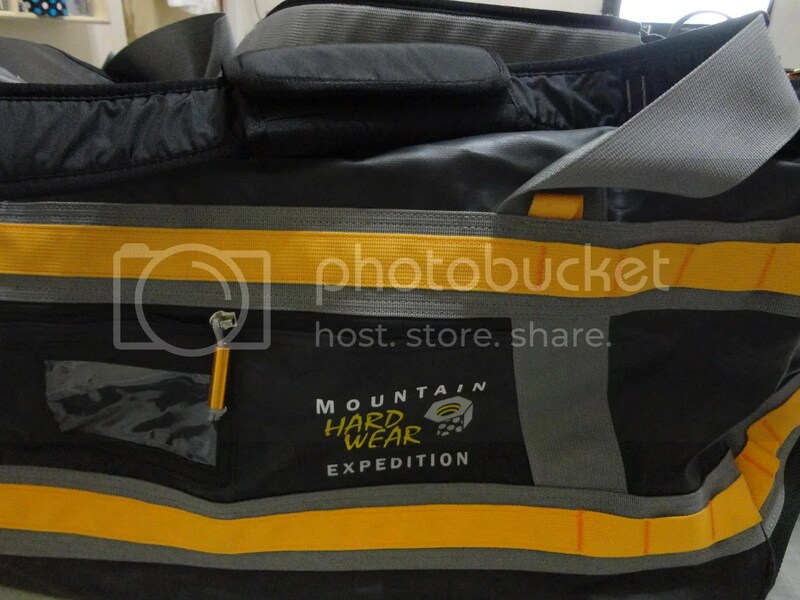 It is very apparent that Mountain HardWear did its job really well on this duffel bag. Inside the bag is a rounded-corner bottom panel that adds to the bag’s durability and helps maintain the bag’s shape. Two internal mesh pockets at each end provide adequate space for extra items such as cellphones, wallets, first-aid kits, or wash bags. There are two internal compression straps. I found this very useful in securing the contents and preventing them from moving around. Access to the bag is provided by a waterproof tarp that overlaps the zippers. The overlapping design is quite clever; it prevents moisture from entering through the zippers. Externally, the duffel bag features numerous nylon daisies which you can use to attach equipment. Both sides have small compartments to store quick-grab items. One side has a transparent sleeve where you can put an ID. Each end of the bag features gold-colored anodized aluminum carry handles for comfortable hauling. 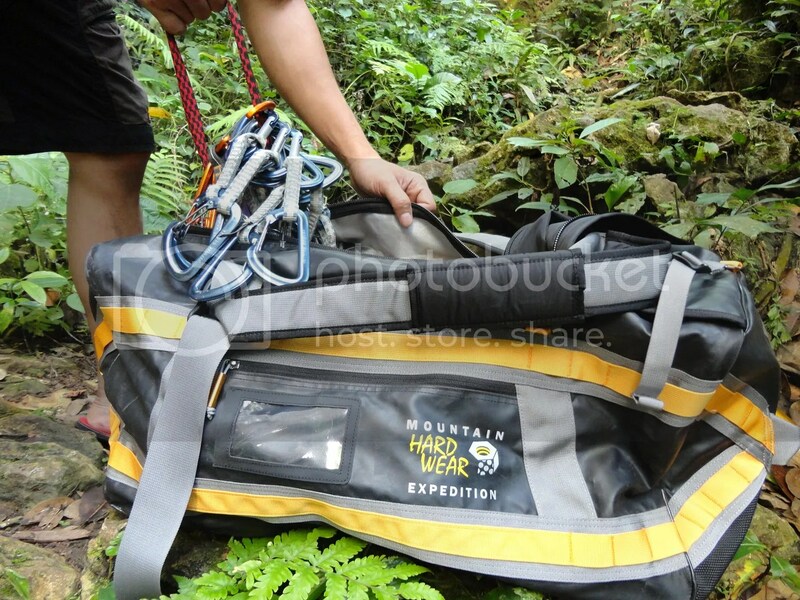 For me, the best feature of the Mountain HardWear Expedition duffel bag is its carry handles. They are designed so that they can double as backpack-style shoulder straps. 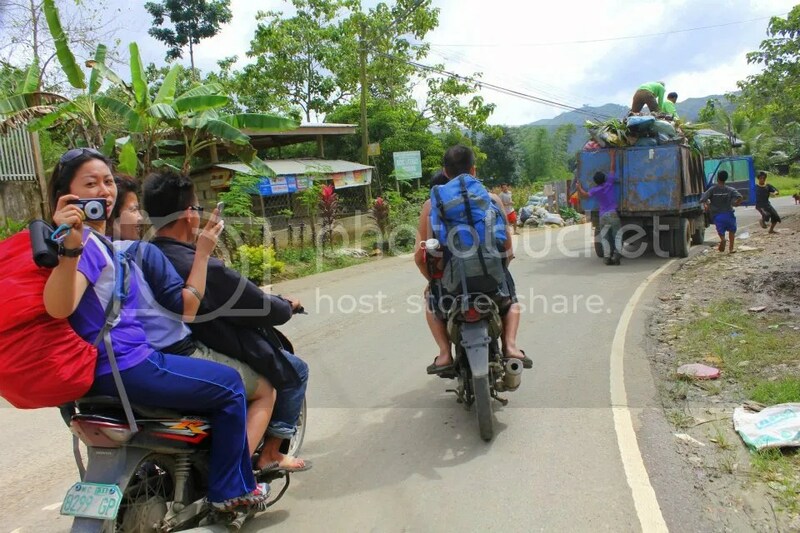 This is really convenient; when carrying heavy loads, it is best to put both my shoulders to work so that the load will be evenly distributed. The straps are padded so they won’t cut into the shoulders. A Medium-sized Expedition has a chunky volume of 90 liters, or 5,500 cubic inches, which is actually a lot of place. In fact, there was still a huge amount of space when I placed all my gear inside. It weighs at a manageable 4 pounds. A character flaw of the Expedition is the absence of a waist belt and a chest strap. A waist belt would definitely be helpful in distributing most of the bag’s weight on the hips rather than the shoulders. 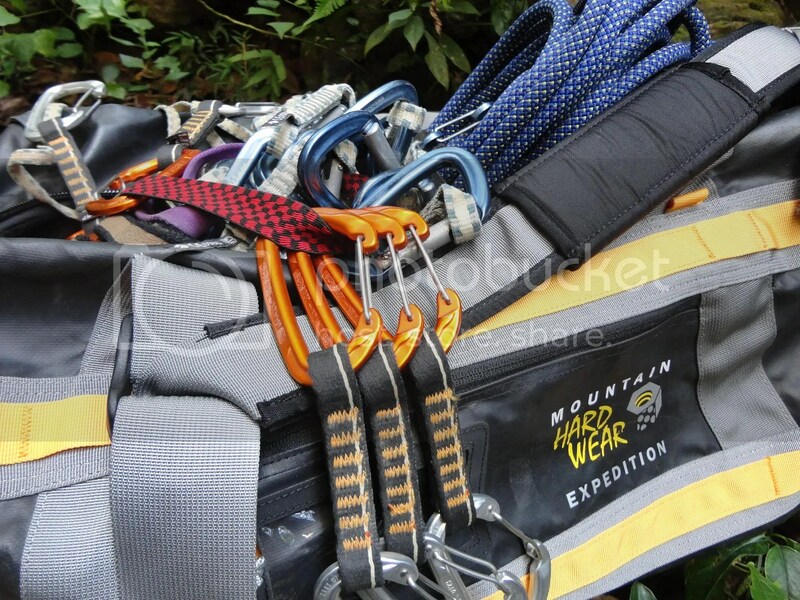 The Mountain HardWear Expedition should definitely be in the list of a rock climber’s equipment. Trust us, a duffel bag can really make your rock climbing experience a fantastic one. And even if you’re not crimping up the crag during the weekend, you can still use your Expedition as an airline luggage, a gym bag, or a beach bag. My 130 litre has started to delaminate after 4 years or so… Very annoying small pieces off the inside and outside material…. Will not buy again. That’s unfortunate. We have ours for around the same period of time, but it still looks and functions excellently. Haven’t experienced any flaking even if we sometimes take it to a sea environment (we sometimes use it to store our scuba gear). Perhaps you might have bought an item from a bad batch?